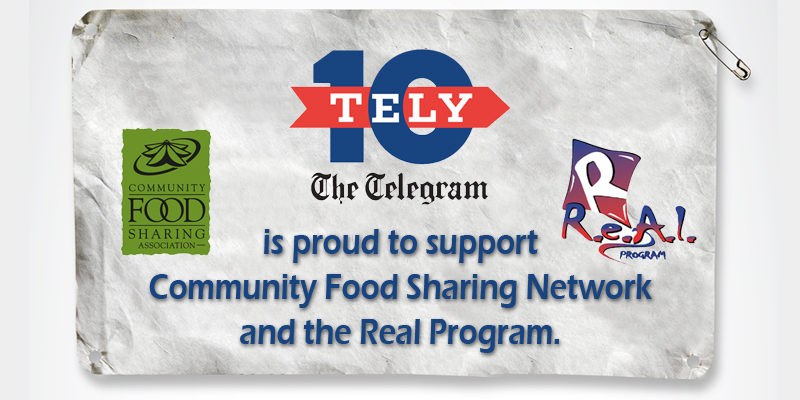 The NLAA/Tely 10 is pleased to support the Community Food Sharing Association of NL and R.E.A.L. Program (Recreation Experiences and Leisure) / Canadian Tire Jumpstart. Please consider donating your gently used running shoes. Taking Strides (Volunteer Sneaker Collection Organization) will be collecting sneakers by during the Tely 10 race kit pickup times at the Curling Club. Thu, July 21st - 7:00 p.m. to 8:30 p.m.
Fri, July 22nd - 11:00 a.m. to 2:00 p.m. and 4:00 p.m. to 7:00 p.m. Sat, July 23rd - 2:00 p.m. to 5:00 p.m.
NLAA is asking race participants to consider bringing non-perishable food items or loonie/toonies to donate when picking up race kit between Thursday and Saturday.